We had an excellent time with our tourguide Phangaj. He ensured he knew were to pick us up from the day before our trip and he had great communication via mobile. This is a highly recommended day trip. This tour was fantastic! We had such a great time and Harry our tour guide was lovely. It was a private tour with Just the two of us and Harry, and we got to see a beautiful sunrise and then walk through many villages to reach the beautiful temple. Would definitely recommend!! Beautiful sunrise and great hike. The scenery was lovely and the day was clear so we could see the mountains. Our tour guide was nice, knowledgeable, and spoke English well. We had a great time. Great hike! 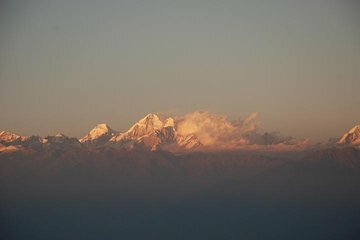 The sunrise was breathtaking and so was the hike through Nagarkot. Our guide was very knowledgable and friendly. Had an amazing experience with a beautiful sunrise. Things went perfectly smoothly and our guide Pankaj was knowledgeable and very helpful, would definitely recommend asking for him when booking this tour. The sunrise view was very beautiful. We also enjoyed the buffet breakfast which was an additional NPR1,250 per person. The hike was nice for us, and we walked a total of about 13km. The first part of the walk was through villages where you get a glimpse of local life, while the second part of the walk was through quiet forests. The pick-up and drop-off from the hotel was fuss-free. The local Nepalese guide was also friendly and able to answer our questions on life in Nepal. Overall, we enjoyed our day hiking tour. Tour was great. Driver was very capable. Guide was courteous and spoke good English. Well worth the money and time. Very interesting walk through the small villages - fascinating to see how people live in the country side. Lots of wildlife too - especially exotic birds. Unfortunately it was misty on the day so no views of the mountains - but still very enjoyable.